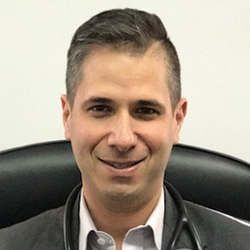 Dr Adam Berger graduated medicine from the University of New South Wales in 2003, and completed physician training at Prince of Wales and Liverpool Hospitals. He completed a postgraduate imaging fellowship at Prince of Wales Hospital before travelling overseas to work at St Paul’s Hospital in Vancouver on a combined clinical/research fellowship, with an emphasis on cardiac CT and MRI. He is a visiting medical officer at Liverpool Hospital, and has admitting rights at Sydney Southwest and Hurstville Private Hospitals. He is also a specialist imaging cardiologist reporting with Spectrum Cardiac Imaging, and is an accredited Level B cardiac CT reporter. His special interest is cardiac CT, especially its utility in the early detection of heart disease, preventative cardiology and in structural heart disease. He also has strong interests in emerging MRI technology, echocardiography, heart failure, atrial fibrillation, and lipid management. He is a strong believer in holistic medicine, and in particular is keen to emphasise the importance of diet and exercise rather than drug therapy alone. Outside of medicine, he is a keen collector of vinyl LPs and an enthusiastic home cook.